As in Vietnam. It’s been two years since I have been back to Vietnam in Milford, MA. The reason is simple. 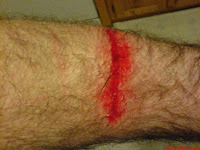 It was the scene of a very nasty and scar-producing crash for me. On my way home that night, I should’ve stopped by the Hospital but instead I went home to lick my wounds. I still wake up at night with the sounds of gnashing aluminum and bones against jagged rocks on that one downhill coming out of the woods. My blood splattered on the rocks like someone poured out a glass of fine California wine because they were rich and couldn’t stand to drink something that only cost $51.99 a bottle in the NH Wine Outlet store. Little did they know they could have gotten a 15% discount if they had purchased a case of bottles. Dumbasses . Below is just one of the area affected 2 years ago…Damn near ripped my arm in half and yet nothing was broken. Still got that scar. But where was I? Oh yeah. I think they call it Posttraumatic Stress Disorder (PTSD). My friends called it good therapy for me to go back. I concur with their excellent judgment. I did fine last night. I think I am in better shape this time than when I was there last so I didn’t get as tired (which attributed to my bloody mess of a crash) on all the flipping rocks and playground activity. I did however WALK down the one hill that caused me so many sleepless nights and anxiety. If you like a lot of playgorund jumps and rolls, then Nam is the place to go. 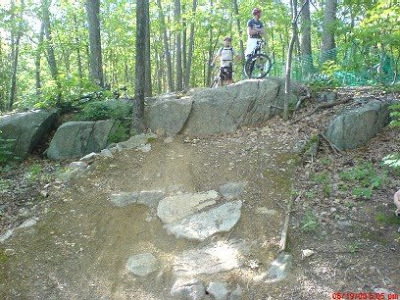 NEMBA has done a fine job creating all the fun and maintaining it to perfection. Consider myself healed as I would go back again. Gringo had the most fun because he jumped off everything that was out there. Here are a couple of videos shot with my cell phone. One. Two. TiTim had to change his shorts on one jump/roller he tried without fear. He misjudged his speed and ended up airborne and almost crashed into a tree. It was classic!!! And Geo…Geo, Geo, Geo. When are you going to get through a ride without breaking your chain??!! You are going to have so many gold quicklinks on it that we are going to have to classify your bike as Blinged-Out. The next evolutionary step after that is to chop it and drop it. I don’t want to see that! Get a new chain. Only this time, spend some actual money and get a good strong one, will ya. 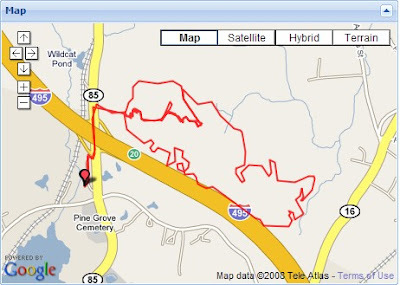 Here is the course detail as uploaded to Garmin Connect. 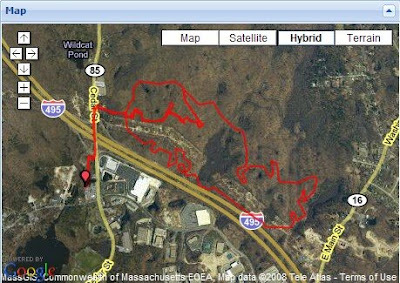 We went 8.22 miles in 2:21:55 ride time averaging 3.5 mph for the ride. At one point I hit a max speed of 23.3 mph (must have been on the road back to the parking lot because the downhills were relatively small and too rocky for speed). Here is the KMZ file to open in Google Earth to take a closer look at the loop. I also included a topo map version and the topo KMZ overlay. Open the topo KMZ file in GE and then open the regular KMZ file and they appear together. Great ride. Post-ride activities consisted of Banquet Venting in the lot and a Dave’s Spicy Chicken sandwich for me on the way home. NICE!! Thanks Dude. The guys accused me of cheating when I popped a Gu, but frankly I have a case of them…I need to use them up! Congrats on conquering your fear. Nice work!